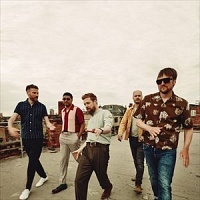 Leeds-based indie-pop band featuring Ricky Wilson (lead vocals), Andrew White (guitar), Simon Rix (bass), Nick Baines (keyboards) and Vijay Mistry on drums (since 2012). The band achieved considerable success with the debut-album, "Employment" and its singles "I Predict A Riot" and "Oh My God". Other hits include the number 1 single, "Ruby" and "Never Miss a Beat". They released their second album, "Yours Truly, Angry Mob" in 2007, followed by "Off with Their Heads" (2008), "The Future Is Medieval" (2011), "Education, Education, Education & War" (2014) and 2016's: "Stay Together".